In a year that gave us Being John Malkovich, The Matrix, Magnolia, American Beauty, and The Blair Witch Project…I do not say this lightly… M. Night Shyamalan’s film The Sixth Sense was the best thing to come out of 1999! It is by far one of the most original and creative suspense/horror movies to come around in a long time and its ending still thrills today. By now it’s no spoiler, but I still don’t want to talk about it. 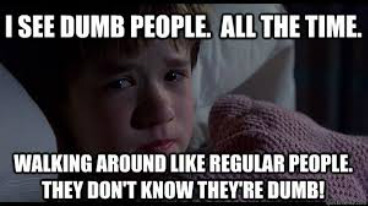 Suffice it to say “I see dead people” is one of the most often quoted movie lines since 1999 for a reason. What I DO want to talk about is color symbolism in this film, specifically the color RED. An author uses colors as symbols because they come culturally loaded with associations. It offers a kind of shorthand for readers/viewers. We see someone wearing white…we think of innocence or purity. I say they are cultural because white symbolizes something completely different in the Asian community. It’s the color they associate with death. We have that in Western cultural as well if you think about the association of ghosts being white, but it’s a secondary reading, not as strongly ingrained as the first two. And that’s okay because multiple meanings offer multiple readings of the same text. RED conjures immediate associations that are contradictory. It calls to mind both love and danger. Red Roses versus a Stop Sign. 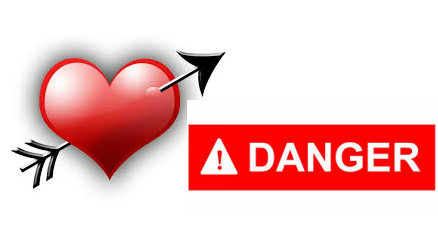 Red Heart Valentines versus Warning Signs. RED is also the color of blood which links it to life and death. It’s that link that Shyamalan is banking on as he uses it in his film. 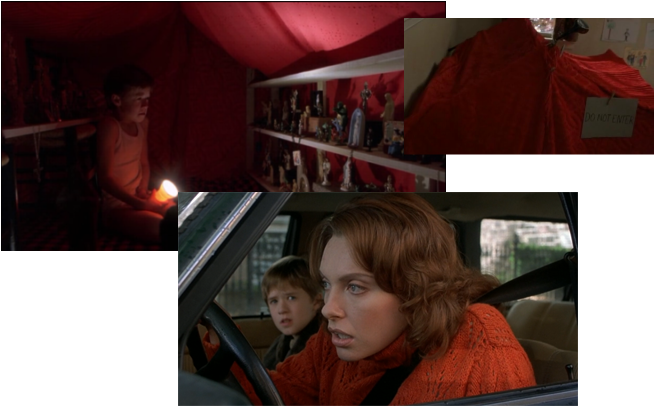 Shyamalan uses the color red in many of his films to signal something important. The Sixth Sense is no different. In a film where exploring the relationship between the real world and the spiritual world, it serves as a visual hint that things have crossed over, so to speak. Let’s start from the beginning. The first time we see Cole, he is leaving his home and running down a street. There is red everywhere from the bricks of the buildings to walls painted red. This indicates that Cole’s fears come from his whole world being tainted by the spiritual realm. He takes refuge in a church whose door is a very noticeably bright red. It’s here where Crowe makes first contact with Cole making the church not a house of refuge anymore, but rather a place where the realms cross over. On his way out, Cole surreptitiously steals a small statue of Jesus wearing a red robe, usually a color only associated with the death of Christ on the cross. The doorknob leading to Crowe’s office is red. Also a strange color for a doorknob, but his office is definitely a space where the realms are crossing over. It’s a place with associations of Crowe working too much and thus sacrificing his marriage. At the end of the film we see this doorknob is locked forbidding him entrance. Crowe’s wife Anna is definitely experiencing this crossover as seen by her wearing a red shawl while she sleeps on the couch and also wearing a red dress in the restaurant where Crowe is late in meeting her. Cole has a red tent in his room and it’s where he meets Kyra for the first time. It’s also where he faces her bravely and finds out what she wants. This leads him to attend the wake at her home where her stepmother who had been poisoning her is wearing…you guessed it…a red dress. The interesting thing is the red tent represents his sanctuary and in the final scene with his mother in the car, she is wearing red. She believes and accepts him and thus becomes his sanctuary. Cole is also wearing a red sweater at the birthday party where he gets shoved into a closet where he hears a ghost threaten him from inside. 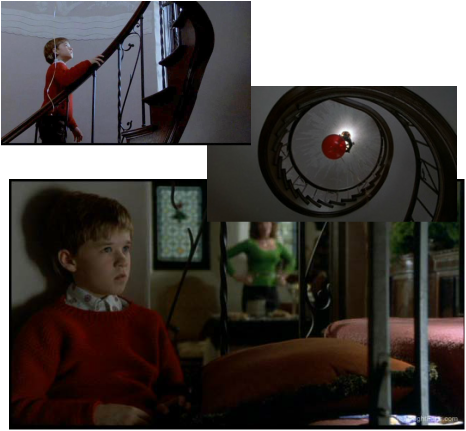 He finds this closet by following a red balloon as it floats up a spiral staircase. Are you beginning to see the connections here???? Red Balloon=floating spirit, spiral staircase=path of life,light at the top=god. This is like textbook stuff here. The final connection with red is the volume numbers on Crowe’s tape recorder as he listens again and again to a session with Vincent as a child…the man who shoots him at the beginning of the film. Here though the numbers are partial red and partially white signifying his acceptance of these worlds crossing over. It’s the scene where Crowe finally understands that Cole has been telling the truth and not just hallucinating or imagining things. "Masque of the Red Death." What does RED mean to you?